Summer at Lapland Lake Nordic Vacation Center is what everyone dreams that a summer should be! The perfect, temperate Adirondack summer climate means playing and relaxing comfortably in the great outdoors. Rediscover nature within the thousands of acres of state protected woodlands and marvel at the rare beauty of a lake still untouched! Our complimentary canoes, kayaks, row boats, and paddle boat let you enjoy the tranquility of Woods Lake. This 70-acre lake prohibits motorboats, so prepare to hear only sounds of the natural surroundings and yourselves. Bring your fishing gear and fish from the boat for smallmouth bass, rainbow trout, perch, pickerel and bullhead with brook trout in our streams! Or paddle out to the middle of the lake and watch the loons, read, or bask in the sun as you float undisturbed. Bring your hiking boots and bikes! (We do have bikes for rent – including fat tire bikes.) Hiking or biking throughout our 30+ miles of wooded trails and along our 3-mile nature trail, you will experience nature untouched by development – a particular beauty and serenity only the Adirondacks can deliver! Hiking opportunities also include the Northville-Placid Trail, a 133+ mile hiking trail connecting the southern Adirondack foothills and the scenic Adirondack High Peaks region. The new Woods Lake section of the Northville-Placid Trail is just minutes from our door. The start of the trail is in nearby Northville NY. Enjoy a day at the beach! We have complimentary sand toys for the kids to build their sandcastles and a nearby swing set with slide. The beach has a softly sloping bottom and the absence of motorboats and jet skis means serene swimming. Because our beach may only be used by overnight guests and by our homeowners, you will love the privacy of our beach. Nothing feels better after a long day of hiking or biking than cooling off in the pristine water of Woods Lake! Other waterfront and outdoor amenities include: lawn games, hammocks, Adirondack chairs, picnic tables, and a beaver family that moves back in every time we clear them off of the lake’s outlet! If you want to bring your motorboat or jet skis, the Great Sacandaga Lake public boat launch is just minutes away. Be sure to check out our list of other area attractions! An Adirondack summer night is something to experience! When the sun has gone down, the pleasant night temperatures mix with a gentle breeze that rustles the leaves of the hardwoods and the branches of the pines. Adirondack summer nights and a campfire just go together. Each tupa is provided with an outdoor fire pit and firewood. Don’t feel like a fire? Take a row boat out under a blanket of stars on Woods Lake for an experience you will never forget! When the long, eventful day is over, retire to your private tupa (Adirondack cottage), sip a glass of wine on the screen porch or play a board game before a night of peaceful rest. The surrounding woodlands offer a gentle background chorus of crickets, birds and the occasional owl. Whether you are visiting alone, as a couple, family, or group, we have lodging accommodations for you! Summer at Lapland Lake promises a vacation you will never forget! And chances are, you will enjoy visiting with Mother Nature so much, you will visit us again! We are the perfect place for family fun or a romantic getaway. Whether it’s outdoor activities you seek, or just rest and relaxation– we have it for you here. 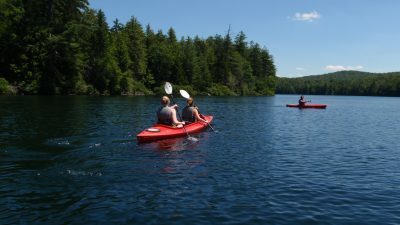 Ask our friendly staff about summer events and area attractions when booking your reservation and come experience the beauty of the Adirondacks and warm Finnish hospitality at Lapland Lake Nordic Vacation Center!